For many, dog sledding is an adventure activity on a long forgotten wish list. It's easy to think you'd need to travel to some remote, snowy corner of the continent to go dog sledding. However, there are easy-to-access dog sledding tours that can be found booked in the Canadian city of Montreal. Dog sledding came to Montreal in January 2012 with the advent of the Montreal Snow Village. Unfortunately, the village is no more, but dog sledding persists as a leading winter attraction: for a few short weeks every winter, locals and visitors can experience dog sledding on the grounds of Parc Jean-Drapeau as part of the annual Fête des neiges de Montréal. This family-friendly festival—which is on its 36th anniversary—celebrates winter with seasonal events including ice sculpting, axe throwing, ice sliding (on the 18 slides), snowshoeing, snow scooter racing, hockey, and more. The best—read: only—time of the year to try out dog sledding in Montreal's urban centre is during Montreal snow festival Fête des neiges, which itself runs on weekends from January 19 to February 10, 2019. Montreal dog sledding tours at Parc Jean-Drapeau run on Saturdays and Sundays between 10 a.m. and 5 p.m. Reservations are required. For an affordable, short introductory run, try Fête des neiges' experience for $16 per adult (13 years and older) and $10 per child. Children ages 5 and under must be accompanied by an adult, and the activity is not recommended for pregnant women. You can also purchase a family sliding pass for four people at $25. Fête des neiges Accropasse passport holders pay only $12 per person and $8 per child. The Accropasse also grants free access to the Biosphere as well as rebates on food and ice skate rentals at the nearby rink. Note that dog sledding is naturally contingent on weather conditions since snow is required for the slide to glide. Check snow conditions online before heading over. There's plenty happening at Parc Jean-Drapeau when dog sledding is on the agenda. Montreal snow festival Fête des neiges is in full swing, as are the park's leading winter attractions, notably one of the city's best outdoor skating experiences open to the public but for a short few winter weekends. The Montreal Biosphere and Stewart Museum are also open at the same time. As for food and drink, the snow festival typically features several pop-up food stands and food trucks serving everything from poutine to maple-drenched delights. 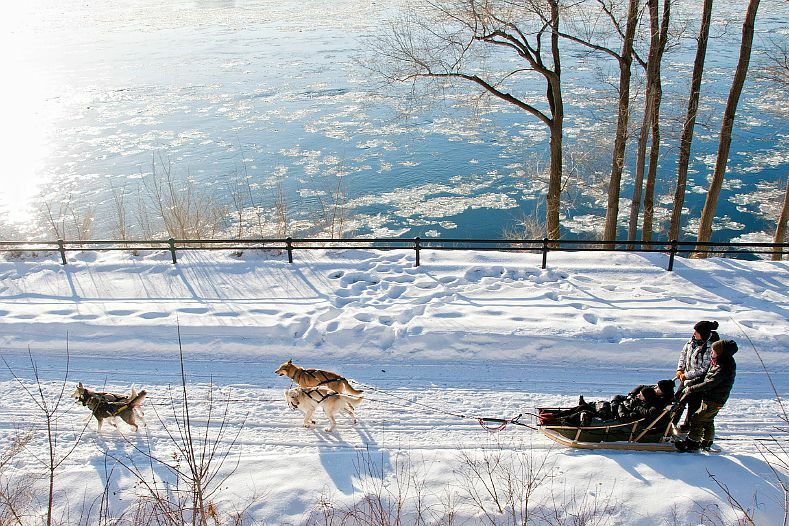 The dog sledding track is built in the heart of Parc Jean-Drapeau, just five minutes from downtown Montreal. The park on Ste. Hélène Island can be reached by the Jean-Drapeau Metro or by car (there is parking on-site). To go dog sledding, you'll need to arrange mandatory reservations by calling (514) 465-0594 or toll-free at 1-800-465-0594.